HB girls are impressive. We're biased, we know. But year after year, the best colleges and universities in the world tell us we're not the only ones who think so. The 105 students in the Class of 2018 will attend 66 different institutions in 23 states and three countries. HB students received offers of admission to all eight Ivy League colleges and 48 percent of students in the class were admitted to a U.S. News & World Report Top 30 College or Top 30 University. Eighty percent of these HB seniors were admitted to their top-choice college (or a top choice, if ranked by group), and nine students are committed to becoming DI and DIII collegiate athletes in seven different sports. More than $16 million in merit and other scholarships, including full tuition packages, was offered to HB students this year. Sixteen of these girls are “lifers,” have begun their HB careers in kindergarten or earlier. 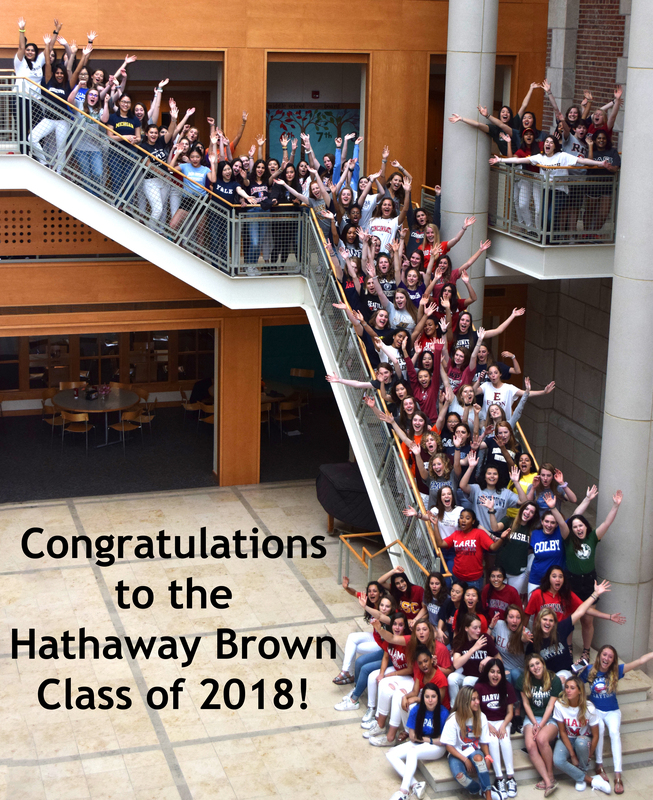 Whether she chooses a college here in Ohio or one that's halfway across the globe, through a combination of immersive experiential learning and outstanding academic preparation delivered by the best teachers anywhere, each Hathaway Brown student is set on a path to find the campus that's right for her. Our girls are equally at home at historic Ivy League schools, top public and private universities, specialized conservatories, and small liberal arts colleges in the U.S. and abroad. We hate to see them leave, but we know it wouldn't be fair to keep them all to ourselves. Hathaway Brown's 142nd Commencement Exercises will take place around the iconic fountain in the HB Courtyard in just a few short weeks, and we'll be "clapping out" the Class of 2018 for the final time. As we reach the end of another memorable school year, please join us in congratulating these amazing students and wishing them well as they get ready to make their own lasting marks on the world.